Hawaiian Shaved Ice Brand | Mary Mack's, Inc.
Hawaiian Shaved Ice is a leading brand in the shaved ice and snow cone industry and has become the go-to brand for premium snow cone syrup flavors. 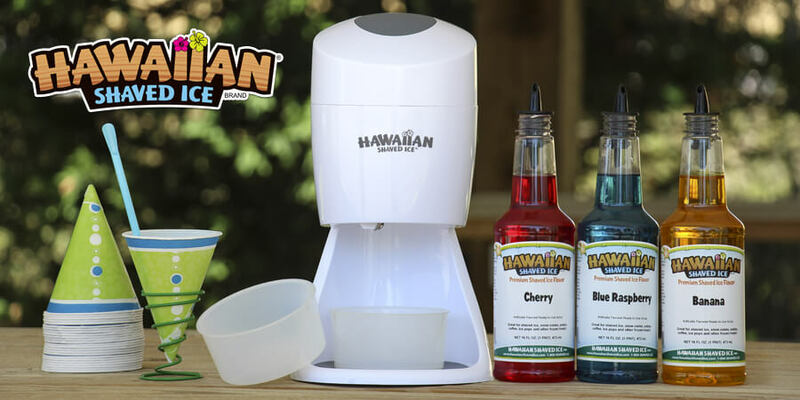 With a focus on enjoying shaved ice from home, Hawaiian Shaved Ice brand can be seen on small, home ice shavers, snow cone machines, snow cone cups, spoon-straws, and flavored syrup. We are dedicated to providing high quality products for families to enjoy. Nothing pleases us more than to see families and friends cooling off with our products. For product inquiries, wholesale opportunities, or more information, visit www.HawaiianShavedIce.com.